I like this post. Consider it another arrow in your quiver against the flu this season. I wrote recently about getting my flu shot and recommended that you do the same. Here are some more good ideas to help get you through the coming five or so months. The immune-boosting nutrients and health benefits of medicinal mushrooms continue to contribute to the large and persuasive body of scientific research. In fact, scientific studies of medicinal mushrooms have increased during the last two decades primarily in Japan, Korea, China, and the US. A spate of medical research demonstrates that different species of mushrooms can aid you. Understanding how food interacts with our bodies and the role it plays in healing various health conditions can be helpful. Whether food is used as part of a medical treatment or a prevention-focused diet, knowledge is power. Though some may disregard medicinal food, medical researchers have proven how prescriptive diets have been used to minify health risks. 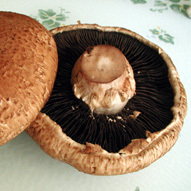 One such functional food is mushrooms. There are currently 38,000 discovered and classified species of mushrooms that hold medicinal benefits. I’ve been writing a lot about the junk food I ate on my recent New York City vacation which included my 40-year high school reunion and my daughter’s NYU graduation. But I also tried to sprinkle in some healthier meals to balance out the hot dogs and fried dough. My daughter picked a vegan restaurant for her graduation dinner and I opted for a plate of five vegetables there. I dislike two of those, Brussel sprouts and sweet potatoes, which I gave away but I enjoyed the fennel, one of the more obscure veggies I grew up eating and still enjoy. I was disappointed the place had no portobello mushroom offerings on its menu. I find those mushrooms exquisite and a worthy alternative to any meat dish. How Many Calories in Portobello Mushrooms? Bison wasn’t the only thing that I loved at a recent food show I attended here in Chicago. One booth was sampling portobello mushrooms made in soy sauce and garlic. We went back several times to that sampling dish. If you haven’t had portobello’s, you’ve missed a great item. And I think they might qualify for Tony’s Mr. Lazy Cook usage as well since they’re relatively quick and easy to make. I like doing them on the grill outdoors in the summer but you also can make them in a frying pan on the stove with just a bit of soy sauce or whatever flavor you’d like them to absorb.